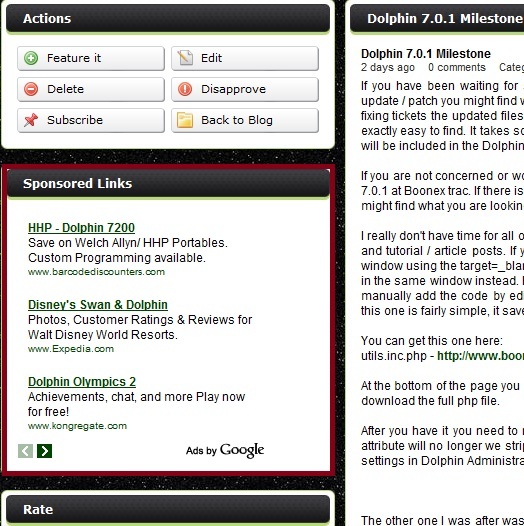 There are several ways to add Google Adsense to Dolphin 7. You can edit and add to the .html files in the template folder. 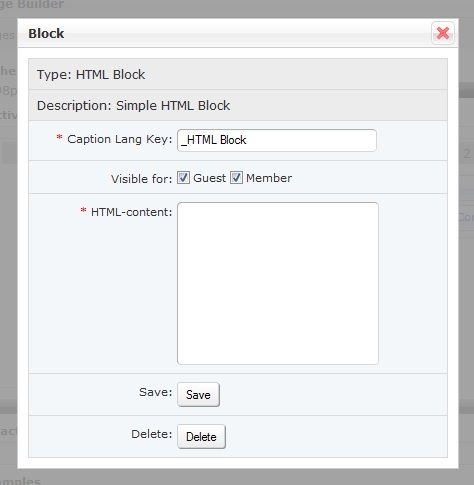 You can custom code a .php file, or simply create a new html block and place the code in the block. 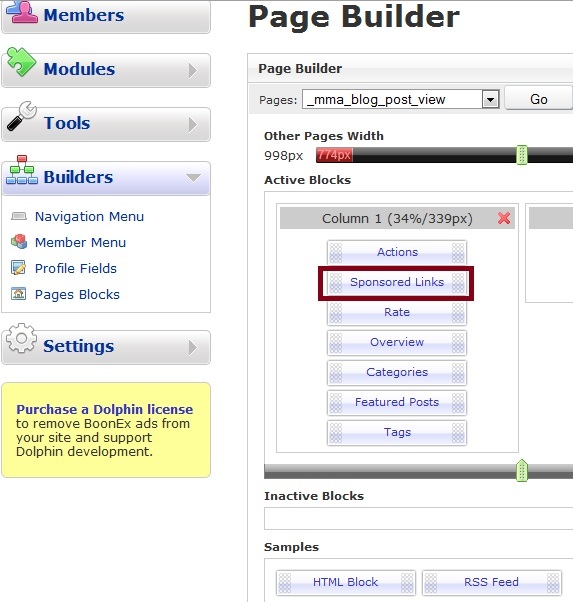 The html block is probably the easiest way of adding Google Adsense in Dolphin 7. It only takes a few moments, and it's mostly just copy and pasting of the code Google supplies you with. You should first create your new Adsense ad in your Google account. Once you get to the point where Google tells you to paste the code into your site it will take approximately 10 minutes before ads will start displaying on your site. Be sure to allow enough time for this before coming to the assumption that something is wrong if you do not see your ads. Because of this I suggest you create the ad first in your Google Adsense account so the process of becoming active begins right away. 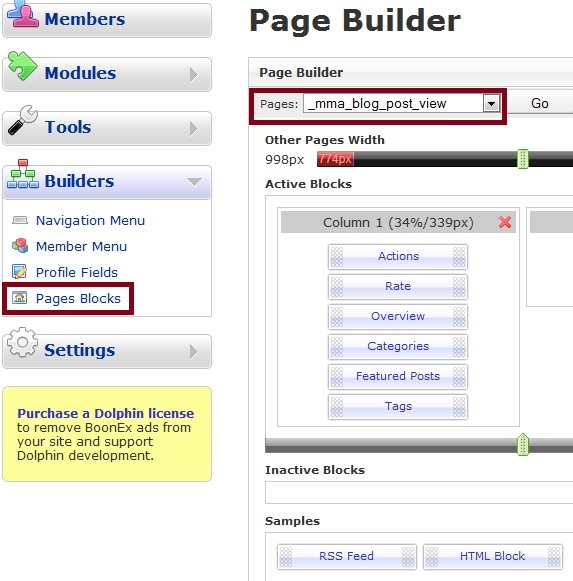 Then login to your Dolphin 7 Administration and navigate to the Builders, and find Pages Blocks. In the center of the screen you will find a drop down menu to select a page. In this example I will be adding Google Adsense to a Blog Post. So we will select "blog post view" in the drop down menu. When the page loads we will see all the blocks currently on our Blog Page listed here. 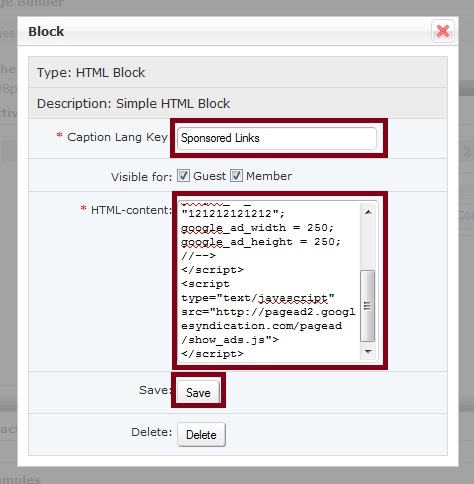 Since I am going to put the Google Adsense code in a html block, I simply drag the html block in the available Samples blocks section at the bottom of the page up to any location on my page. I created a 250x250 square text ad in Google so I think a good location would be near the top left part of the page. This is where I will put the html block. Once I have the block in place, I simply click on the center of it to edit the contents of the block. A little window will open to enter the details. Caption Lang Key - Will be the title of the block. HTML-content: is the actual content that will go into the block which will be the code I got from my Google Adsense account. Just copy it from your Google Adsense account and paste it into here. Then just save the changes. After saving the block it will then say Sponsored Links. Navigate to a blog post on your site and you should see the block "Sponsored Links" you just created. If your ads are not showing make sure you have allowed enough time to pass for the ad to become active in your Google account. It will say new at first in Google, and it will say Active after about 10 minutes give or take. If it says active and you still do not see your ads, make sure your computer, software, or setup is not blocking google ads. There are a few blockers out there that will occasionally block google ads. 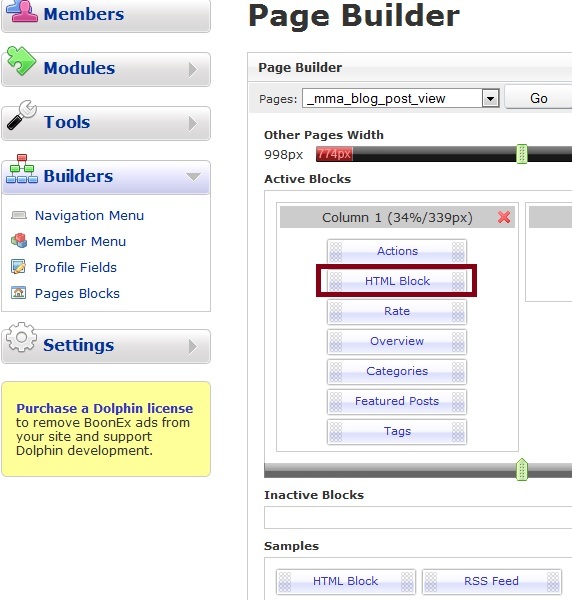 If you want to move the block you just created to a different location on the page, just log back into your Dolphin 7 Administration and go to the Page Builders again. Find the "blog post view" in the drop down menu. Then, grab the Sponsored Links block with your mouse and move it to a new location on the page. After that, just refresh the blog post page to see the changes. Pretty simple, and it looks decent too. I would also recommend that you do not go overboard with too many Google Ads all over your site. More ads doesn't mean more revenue, and oftentimes if there is just too many ads it can discourage people from coming back.